Beats on Pointe: Masters of Choreography tickets now available! The Masters of Choreography are back with their worldwide sell-out show to once again push the boundaries of conventional dance. Tickets for Beats on Pointe are a must have for any fan of dance as this spectacular production is an incredible fusion of the opposing dance styles of street and ballet. What is Beats on Pointe? Showcasing the differences between dance styles, this production is a contemporary love letter to dance that fuses together street style and ballet in a dance-off like fashion. Tightly choreographed, this show takes the electrifying elements of street dance and the classic qualities of ballet to create a captivating performance, perfect for audiences of the widest range. Beats on Pointe features a highly talented cast of dance athletes, who bring us a fusion of captivating dance theatre along with freestyle acts and even a dash of well-timed comedy. These wonderful multi-talented performers, with the addition of an epic soundtrack, perfectly display this magnificent blend of contemporary and classic styles both in music and dance. Who created this dynamic sell-out dance show? The Masters of Choreography are a world-leading Australian dance and theatre production company. Jennifer and Milo Masters lead the company and have seen it, and the hundreds of dancers and choreographers that have participated in and contributed to their productions, have authority in the dance world arena. Their productions have featured across the world, in Australia, Europe and the UK, with highlighting seasons in London’s West End. Beats on Pointe is one of their most recent works which is internationally acclaimed, and a sell-out hit across the world! You won’t want to miss your chance to see this spectacular, cutting-edge dance show. 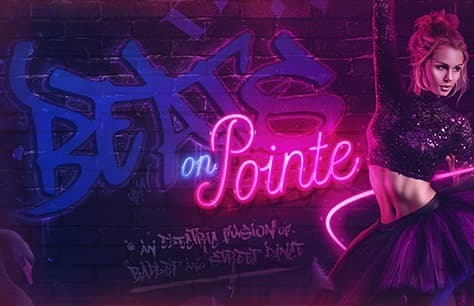 Be sure to book your Beats on Pointe tickets for this limited season at London’s Peacock Theatre from 21 May to 16 June 2019 before it continues in its pattern of selling out!